The Redcliff Mennonite Alternative School was opened to the public on Oct. 29. 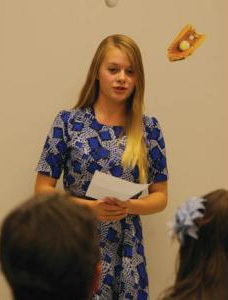 Pictured: Student, Lena Reimer talks about her hopes for herself and the school. On Oct. 29, the Redcliff Mennonite Alternative Program School opened its doors to the public as they celebrated their new learning environment. The Mennonite community have wanted a school, much like the school they have in Burdett that offered the German and religion class. The Prairie Rose school division saw that their was an opportunity and that there were students that would access a program with those qualities. The students have been waiting since last year when they had two classrooms, which were very full because it went from kindergarten to Grade 9, so they had rooms full of a variety of ages. The principal of the school, Tracy Frank was extremely elated for the students and the warm welcome from the community for their new and improved space. “They’ve been just very excited to get into our space and we’ve involved them all along the way showing them pictures and telling them what was going on in the building. I think they really took ownership and they seem very comfortable and very proud that this is there space,” she said. The school still gives an Alberta curriculum but with the only difference being that they get the German and Religion class. The school also teaches in divisions, so they tend to cycle their material. The three divisions are separated with Grades 1 to 3 in division one, Grades 4-6 in division two and Grades 7-9 in division three. They will then pick topics from each grade and the next year they will cycle to other topics in the same subject or will pick a grade that year and then the next year do the next grade and so on. One of the big benefits of the school is the level of comfort that the students have with one another. Family is one of the components the school has to offer, with students being very familiar with each other. “The sense of family is definitely high here, obviously because you’ve got your four or five siblings with you here and all of your cousins and the real positive role models that the younger kids get to see in the older students. I think that that’s a really big positive for our school,” Frank said.